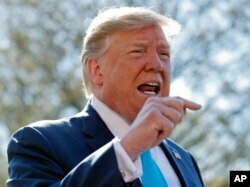 President Donald Trump speaks with reporters about border policy during a fundraising event, April 10, 2019, in San Antonio, Texas. Former Defense Secretary William Perry, who served under President Bill Clinton in the 1990s, rejected Trump’s suggested use of force. “The U.S. Armed Forces are not hired thugs to be used to ‘rough up’ non-violent civilians for political games, and expressing the desire to utilize them as such disrespects the dignity and honor of our men and women in uniform,” Perry posted on Twitter. 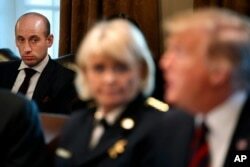 White House senior adviser Stephen Miller, left, listens listens as President Donald Trump, at right, speaks during a roundtable discussion on border security with local leaders, Jan. 11, 2019, in the Cabinet Room of the White House in Washington.